The tools of war were derived from tools for everyday jobs. The only genuine exception to this was the sword - the mark of the true warrior. 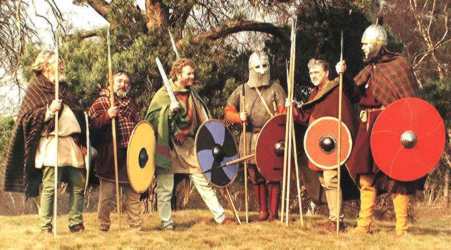 Members of Regia Anglorum in 1996 as pagan Saxon and British warriors at Sutton Hoo for a BBC production about the Sutton Hoo excavation in 1939. The main weapon of the period was the spear, not only for the peasant but also for the professional soldier and even the nobility. It was the traditional weapon that Woden used and remained the weapon par excellence among the Germanic peoples even during the tenth and eleventh centuries. At the battle of Maldon in 991 the Eorl led his men into battle armed with his 'spear and shield'; it was only after he had killed two men with his spears that he then drew his sword to engage a third man. There were several types of spear. The first was the light throwing spear or javelin. Manuscripts of the period often show warriors holding a number of spears in the shield hand (three seems to be the most practical whilst still gripping the shield, as shown in tests), and another in the weapon hand. Presumably most of these were for throwing as the opposing sides closed, whilst the last was retained for hand to hand combat. 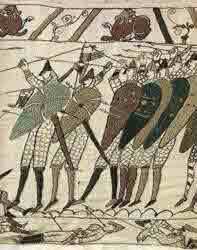 In early Anglo-Saxon times some Germanic warriors used a special type of javelin known as an 'angon'. This was most probably based on the Roman pilum, and had an elongated iron socket, often as long as 75cm (30'), and a barbed head. When this type of spear stuck into a shield it would sink in up to the barbs, bend, and make it very difficult to remove. With the angon firmly embedded, the shield would become too cumbersome to move, thus rendering it useless. This would perhaps then cause the warrior to discard his shield, or at least retire to find another, thus removing him from the action. Through our own experiments we have concluded that javelins could have been launched when the two opposing sides were about 30 - 40 paces apart. The most likely scenario involves maintaining the integrity of the shield wall, with the men behind doing all the throwing of the javelins. It is quite easy to catch a javelin in flight, as it moves relatively slowly through the air. Since it travels so slowly, an individual can easily side-step the approaching missile. So the best opportunity to kill an opponent with a javelin is to launch it at a mass of bodies, where you would be bound to catch someone or something, or to wait for the moment when your opponent was unaware that it was coming. Although a javelin weighs a pound or two (one kilogram), it develops enough inertia when thrown to go straight through a lime wood shield, whether it is clad in leather or not, and possibly into the owner of the shield at the same time. When we tried a javelin against a cloth covered pig carcass, it nearly passed all the way through the body, and with mail on, it only managed to penetrate some 5 inches (13 cms) or so. We also discovered that such a weapon does not even need to be sharp to be successful. The thrusting spear tended to have a stronger, fairly broad leaf or lozenge shaped head with a central ridge for strength. The heads were attached to the wooden shaft by a socket. The sockets were usually riveted to the shaft and some have two small lugs near the base of the socket to allow the head to be possibly bound on as well. The length of the spear varied from about 1.5 - 2.7m (5' - 9'), but around 2.1m (7') was the commonest length. The last type of spear is really just a variant of the second type and is called a winged spear. On the side of the socket are two projections which are used to catch and lock an opponent's spear, or to hook an opponents shield out of the way. The spear was, without doubt, the commonest weapon of this period and its almost universal use within all ranks and cultures testifies to its effectiveness. It is a weapon that can make an untrained man fairly dangerous very quickly. It keeps your enemy at a fair distance, and most importantly cheap to make. The ash shaft being easy to acquire, and a relative small amount of expensive iron necessary for the blade. Even a poorly made spear could be dangerous. This cannot be said of the other weapons available then. The spear was retained for as long as possible in a battle and it is probably for this reason that the armoured fighting glove was apparently considered a waste of time, if it was considered at all. Some of the spears found in Scandinavian contexts have an almost rapier-like blade in appearance; others tended to be squatter. At any rate, it must be said that even the best mail and padding would not be proof against a strong thrust from such weapons. Spears were generally used in an over arm technique, (this can be seen in period manuscripts), which meant the prime targets were the face (particularly the eyes, the weakest part of the skull, the throat and upper chest; there being little sense in embedding the blade too permanently in your opponents shield. One big advantage of this method of using a spear is that there was no need to change the grip in order to throw it. Regia does not employ this technique during our own re-enactments for reasons of pure safety. However, two hands on a spear and a hefty shove can be quite painful enough. 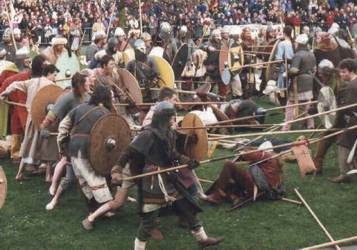 Members of Regia Anglorum at York in 1998 demonstrating the use of masses of spears in an attack. The view from the side like this seems more confusing than it is when you are a combatant on the field. At times though, it still feels as if all of those spears are aimed at you.